On September 10, 2009, Senator Lawrence Borst was awarded the IUPUI Chancellor's Medallion by Chancellor Charles R. Bantz during the IUPUI Board of Advisors Reception at Cedar Crest. Dr. Borst was recognized for his four decades of political service to the city of Indianapolis and the state of Indiana. In 1950, Dr. Borst graduated from the School of Veterinary Medicine at the Ohio State University. In addition to being a practicing veterinarian for many years, Dr. Borst also served as secretary and president of the Indiana Veterinary Medical Association prior to his service in the political arena. In 1965, Dr. Borst co-founded the Republican Action Committee. In political service to Indianapolis, Dr. Borst was a member of the Mayor’s Progress Committee in 1971 and the executive council in 1973. At the state level, Dr. Borst served in the Indiana House of Representatives in 1967 before he was elected to serve in the Indiana Senate from 1969 to 1984. 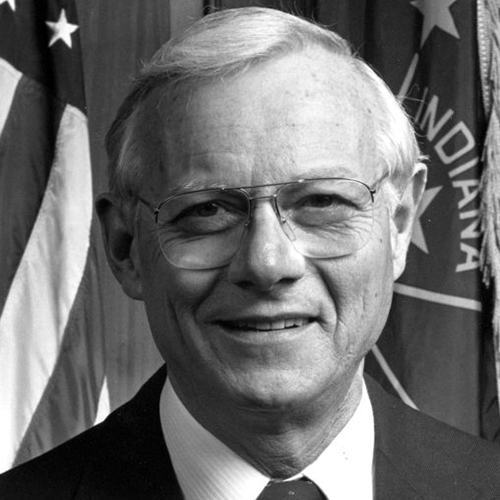 He was chairman of the Senate Finance Committee and the Taxation Sub-committee and helped create the Hoosier Lottery. In addition, Dr. Borst devoted his efforts to many philanthropic organizations and wrote a memoir of his years in politics titled Gentlemen, It's Been My Pleasure; Four Decades in the Indiana Legislature.